Energy markets in Ontario have behaved far differently during the early months of 2014 than they have for many years. 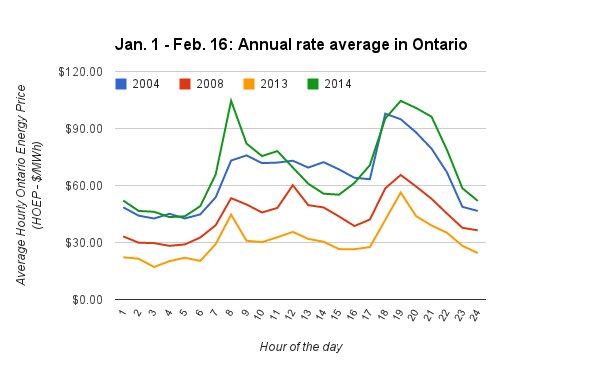 Most Ontario ratepayers will experience a rare instance of the total commodity cost dropping in January. Unfortunately, that's not going to be a trend; the first 7 weeks of 2014 are more notable for questions the behaviour of Ontario's energy markets bring up regarding Ontario's markets, the reliability of it's energy supply chain, and the competency of it's bureaucracy to manage the system in a manner that provides value to both ratepayers and the overall public. January's final numbers for the Ontario electricity market are a monthly average (weighted) Hourly Ontario Energy Price (HOEP) of $65.43/MWh (the highest since December 2005) plus a global adjustment rate (class B) of $12.61/MWh: the total, $78.04/MWh, is down from $81.58 in January 2013. The big lag on OPG’s earnings has been the unregulated hydroelectric segment. It contributed more than $500-million or 46% of OPG’s pre-tax generation in 2008. Now it loses money. The reason for the loss is simple: OPG’s non-regulated hydro-electric assets are the only significant generation in Ontario exposed to the market price of electricity, which has collapsed under the McGuinty Liberal green energy manipulations. OPG’s non-regulated generation has fallen by 31% since 2008, revenue by 58%. In 2014, coal-fired generation is removed from the market place, and suddenly the value of production from OPG's non-regulated hydroelectric assets is receiving ~$71/MWh, instead of the $33 it received for the corresponding period in 2013. I estimate the difference is nearly $90 million in revenue to OPG, and we are only 7 weeks into the first year without coal. Critics of continuing coal past the 2007 date originally promised by Dalton McGuinty, in 2003, blamed the IESO for forcing it to continue operating; as demand dropped after 2005, and in light of the 4500MW of natural gas-fired capacity entering operation from 2008-2010, it's worth asking if the generation from Lambton and Nanticoke were needed in 2011 and 2012. One reason it's worth asking is because of the damage done to OPG's profitability by the supply glut depressing the HOEP; another is because it's also worth wondering if Lambton and/or Nanticoke wouldn't be useful right about now. The "energy" in the HOEP has always been a misnomer- it's an electricity price. There are other "energy" prices in Ontario. There are many times the HOEP is set by the price of natural gas - and the price of natural gas is a story all on it's own; pushing electricity generation into the tasks demanded of natural gas adds a new pricing risks to residential gas consumers. In terms of the final electricity rate being lower for most of Ontario's ratepayers exposed to the market, it's not because the cost of procuring supply dropped; I estimate the average rate for supply rose $2.39/MWh, but last year's losses on exports added ~$5/MWh to last January's bills. The costs to Ontario ratepayers is a little lower because the rate recovered from export customers was more than twice last year's. Known mechanisms at work in causing the higher market rate (HOEP) include rising natural gas prices being the marginal supply at times, and exports setting even higher prices at other times. Screen capture from NGI Data - price at Dawn hub soars! The contract winners are assured that they will have sufficient ongoing revenue to meet their fixed project costs, such as capital and financing, if they operate efficiently according to the pre-agreed standards. When market revenues exceed these fixed-cost requirements, the contracts stipulate that 95 per cent of the surplus will flow back to ratepayers. All good, except that in February the NRR contracts generators have not been generating at the same level they did in January - even as the HOEP has continued to be higher than we've seen since 2005. They don't even seem to be operating at the same level they've operated at in past Februaries. This raises questions about the security of energy supply, particularly as the change in pricing performance occur in the first high demand months since Ontario shuttered it's coal-fired plants (Thunder Bay GS excepted). are the NRR suppliers attempting to lock-in supply in advance (hedge), as suppliers in a competitive market might, or do they not, because most profits aren't to benefit them at all? should the NRR contracts allow them to lock-in supply? do we have enough supply for an extended period of cold temperatures, both in terms of storage capability and pipeline capacity? I do know that 8 of the past 9 days Ontario has been a net importer of electricity - and that was only true 9 days from 2010-2012. Over the first 16 days of 2014's February, the NRR gas generators contracted to have supply available have generated less electricity than they did during the same period in each of the past 3 years. A dozen years into what was supposed to be a competitive market the questions that need to be answered for Ontario to have functioning energy markets, for electricity and beyond, are not likely to be asked. Ontario copied Germany's feed-in tariff (FIT) program but not it's coal policies. It's not apparent that ordering a la carte off of the German menu was feasible; the lack of peaking depth in Ontario seems to be a key determinant of a newer, peakier, daily pricing profile. The demand reported by the system operator is not as high as what it reported in 2008, and well below the level of 2004, but those numbers are less and less reliable; only a midday drop in pricing indicates inexcusably unreported solar production. The shrinking of the global adjustment, which I've called "a measurement of the dysfunction of Ontario's market," is a healthy sign. The pricing curve is now brutally honest in identifying the morning demand ramp and the evening peak demand - with much of the peak demand occuring during, comically, "off-peak" pricing hours. The market's behaviour this winter indicates troubling questions for a province intent on shrinking it's diversity of firm, reliable supply.